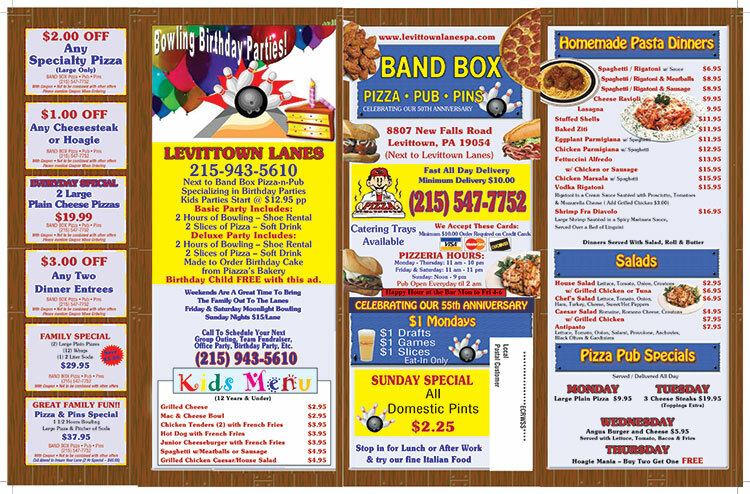 Welcome to the Band Box Pizza and Pub at Levittown Lanes, serving Bucks County PA since 1962! Our family, the Episcopo’s have owned Band Box for close to 50 years, so we know the customers and the customers know us! We’re more than just bowling, as we offer one of the finest pubs and pizza restaurant spots in the Levittown and Fairless Hills, Bucks County, PA area. Pizza, pub and bowling, all in one spot? You bet! We do it all, and we do it right. Serving up made to order, crisp slices of delicious pizza, authentic Italian cuisine and cold brews while you hang out at the lanes. Our pizza menu boasts an array of pies to satisfy any hunger! We offer the lowest prices around in our Tavern, our pizza is the best around, Alessandro Farina (Dominicks Pizza) is our main guy in the kitchen, he has been tossing pizzas for 40 years, he’s the best because we use the finest ingredients in our pizzas and Italian Dishes. Our Vodka Rigatoni is to die for, try it everywhere else and then come in and taste Alex’s version of this Italian classic. You’ll be back for more. 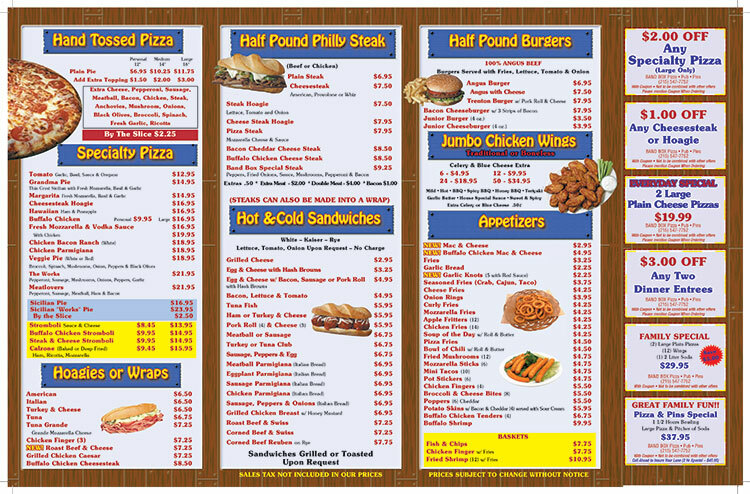 We do offer a full service menu, burgers to dinners, finger foods, salads, & more! Our pizza restaurant also makes us the perfect spot to host your event or party. From birthday parties to bowling league celebrations, we can do it all. With catering on-site, you can enjoy bowling while your pizza is made fresh and hot, ready for eating! Take the family out for a nice meal and treat them to a few games in the bowling alley, or bring your friends and grab some brews and pies before you start a competitive, but friendly game on the lanes. With a friendly staff, and amazing food and drink specials right at your fingertips, Levittown Lanes provides countless hours of fun for people of all ages. We are proud to be a part of the Bucks County PA community and look forward to serving you, your family and friends as you enjoy a night out! Our hours are: Monday-Thursday 11Am-10PM, Friday-Saturday 11Am-11PM and Sunday Noon-9PM. Our pub is open every day until 2AM. Eat-in, take-out or delivery options are available, and you can find out more information by checking out our pizza menu. For more information, if you would like to schedule a party, or simply want to come enjoy some authentic pizza, contact us today! Stop by the New Band Box – Pizza – Pub & Pins…we’re not your dad’s bar anymore!